Week 1 was a surprising week for football with Le’veon Bell’s sitting, Ryan Fitzpatrick’s starting, and Aaron Rodgers’ returning. Unexpected players proved to be stars, while usually incredible players had mediocre games, so who will be a good fantasy pick for Week 2? 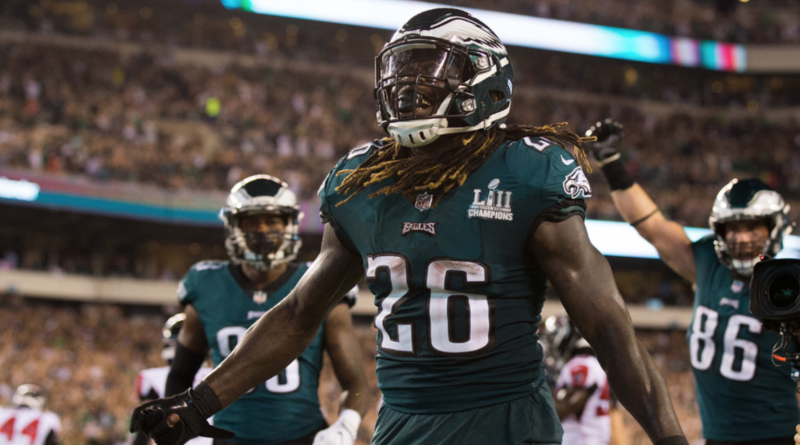 Jay Ajayi was only one of many surprises in the first week of the NFL season, scoring two touchdowns in the Philadelphia Eagles’ 18-12 win over the Atlanta Falcons. He racked up 20.2 fantasy points, making him an absolute steal in the draft. This week, the Eagles play the Buccaneers who have the ESPN ranked sixth-worst defense and special teams in the NFL. In their 48-40 victory over Drew Brees and the New Orleans Saints, the Bucs allowed a whopping 439 passing yards, but only 38 rushing yards, giving up roughly 3.5 yards per rushing attempt. Despite the poor passing defense, their run defense worked, so you might want to steer clear of the Eagles’ RB in Week 2. Instead, Todd Gurley or James Connor should start. Gurley’s running against a roughly middle of the pack Arizona Cardinals’ defense who allowed 161 rushing yards, roughly 5.2 yards per rush in their 24-6 loss to the Washington Redskins. Gurley’s also faster and more powerful than the Redskins’ Adrian Peterson, so he should have a bigger game. Connor was the premier rusher in the NFL last week in Pittsburgh’s 21-21 tie with Cleveland. He’s rushing against the ESPN ranked 21st best defense Kansas City Chiefs who are coming off of a 38-28 victory over the Los Angeles Chargers. Despite allowing zero touchdowns by way of the run, KC allowed 103 rushing yards on 20 attempts, which averages out to about 5.2 yards per rush. Connor, as we saw in his explosive 135 yard, 2 TD performance, can capitalize on a defense slow to defend the run game. As far as wide receivers, though Randall Cobb was not a top five receiver in Week 1, he played a quarter of his Packers 24-23 victory over the Bears with Deshone Kizer at quarterback instead of number one fantasy ranked Rodgers. Kizer tossed an interception and passed for only 55 yards, so Cobb’s stats took a hit during that drive. He caught nine passes for 142 yards averaging 15.8 yards per play, as well as an important fourth quarter touchdown. He should have a good game against the Minnesota Vikings. Even though the Vikes beat Jimmy Garoppolo and the San Francisco 49ers 24-16, Jimmy G managed to throw for 261 yards. Granted, he only completed 15 of 33 passes, Rodgers is a far more experienced quarterback who will undoubtedly do better than a second-year starter like the Niners’ QB. A dark horse candidate at WR is the New England Patriots’ Phillip Dorsett. While he only caught for 66 yards, he scored a touchdown on the tough Houston Texans’ defense. Tom Brady also found him seven times, and in Week 2, against the strong Jacksonville defense, the 41 year old QB will be looking for short gains, rather than hucking it deep to Rob Gronkowski on every throw, like most teams expect him to. If you’re looking for a player that will fly under the radar and won’t alarm your opponent when you pick him up, but will certainly alarm them once the game is over, Dorsett is a good choice. At tight end, Gronk is almost never a bad choice, but Jared Cook made a big impact on his Oakland Raiders’ Monday night 33-13 loss to the Rams. Despite not scoring, he caught nine passes for 180 yards. ONE-HUNDRED AND EIGHTY YARDS ON NINE PASSES! That’s 20 yards every time he touches the ball. The Raiders are set to play the number nine ranked defense by ESPN in the NFL, the Denver Broncos. Denver beat the Seattle Seahawks 27-24, but all three of Seattle’s TDs were passing and Russell Wilson threw for 298 yards. For kickers, you have to look at who has the best offense, so you can’t really go wrong with the Rams’ Greg Zuerlein, New England’s Stephen Gostkowski, or Pittsburgh’s Chris Boswell, but unexpectedly good offenses showcased underrated kickers like the Jets’ Jason Myers. Myers’ Jets are facing the Miami Dolphins, who allowed a net 336 yards in Week 2 to the Tennessee Titans. In the Dolphins/Titans game, Tennessee QB Marcus Mariota passed for 103 yards before injuring his elbow on a hit from William Hayes in the third quarter and Blaine Gabbert stepped in right after to pass for 117 yards. In less than ⅜ of a normal game, the Tennessee backup passed for more than 100 yards, so against the strong arm of rookie Sam Darnold, the Miami defense will be in trouble and Myers will get many opportunities to kick. The Baltimore Ravens, Carolina Panthers, and the Redskins all allowed fewer than ten points, however you shouldn’t bet on all three defenses. Of those three, Carolina is the best choice. They have the Atlanta Falcons, who Philly held to 12 points. Wait, then what about the Eagles? They’re a good pick, too because they’re playing Tampa Bay who allowed 40 points. Yes, Tampa Bay allowed very few rushing yards, but we’re talking about Philadelphia’s defense, not TB’s. The Redskins have the Indianapolis Colts this week, who lost in an epic comeback to the Cincinnati Bengals, but remember that the Colts scored all of their 23 points in the first three quarters. Indianapolis’ QB Andrew Luck, finally returning from injury, passed for 319 yards and two touchdowns. Washington only allowed 153 passing yards from Arizona’s Sam Bradford, so they will likely force the Colts to run and they do not have a strong rushing game. The Redskins aren’t a bad pick. The Ravens destroyed the Buffalo Bills 47-3, but you have to understand that the two quarterbacks they faced were nervous wreck Nathan Peterman and shaky rookie Josh Allen. Now, the Ravens have to walk into Cincinnati to face a red-hot Bengals’ team coming off an exciting comeback over Indianapolis to win 34-23. Last week, Andy Dalton passed for 243 yards and two TDs, hitting 21 of 28 receivers, as well as the outstanding running game from Joe Mixon, who rushed for 95 yards on 17 carries, averaging about 5.6 yards per rush. Sure, they did that against ESPN’s worst ranked defense, but it’s still no small feat. Baltimore is ESPN’s fifth best ranked defense, but Cincy’s powerful offense still makes Baltimore a bit of a wild card as far as fantasy goes. If you want a sure shot great defense, you should stay away from the Ravens and go with someone more stable like Carolina. Now, we get to arguably the most important position in fantasy, the quarterbacks. Despite having a rough start, the Bills’ Peterman had an excellent preseason and he’s playing the Los Angeles Chargers who he’s seen before. If you’re looking for a dark horse QB, then-just kidding, if Sean McDermott ever starts Peterman again he should be banned from ever even viewing a football game. The Bucs’ Fitzpatrick had an excellent Week 1 outing passing for 417 yards, four touchdowns, and zero interceptions, but he’s never been consistent and he’s playing against the Eagles who are ESPN’s second best ranked defense. A safer bet is probably a running quarterback like Russell Wilson, Cam Newton, or Deshaun Watson. Running QBs attain passing yards as well as rushing yards, ultimately gaining more points. The most surprising performance from a running quarterback came from Cleveland’s Tyrod Taylor. He not only passed for 197 yards and one TD, but he rushed for 77 yards and another TD, as well. The Browns have the New Orleans Saints this week, who allowed the aforementioned stats put up by Ryan Fitzpatrick (which do not paint the Saints in a positive light), as well as 112 rushing yards, and one rushing touchdown. These are the best bets for Week 2 of the NFL regular season. Sometimes in fantasy football you have to be unconventional. Good luck, everyone, see you next week for more FFL advice.